Technique of the Week: Crimping | We Like to Cook! 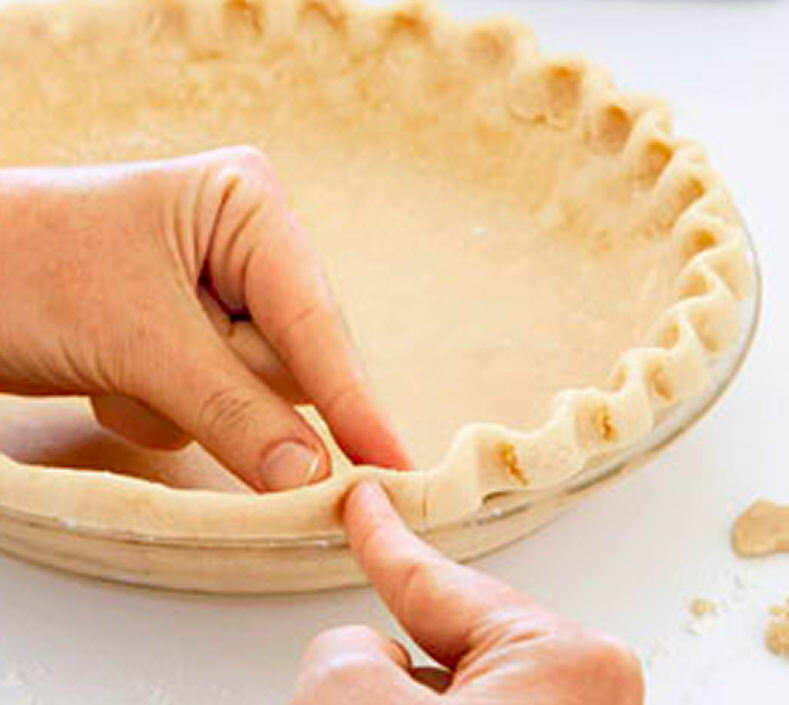 Crimping is the techniques used to decorate the edges of a pie in order to ensure the edges are well sealed. Begin by trimming the extra dough hanging over the edge with a knife or your fingers. Then, tuck the dough around the edge, creating an even ridge around the circumference of the pie plate. 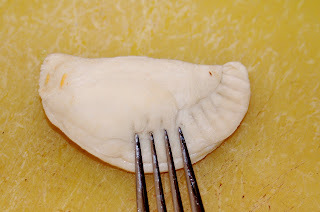 If you find a thin spot, you can add a little bit of dough from the scraps you removed earlier. Once you have an even edge on the way around the pie, pinch the pastry dough with a finger and thumb of one hand and pressing with the fore finger of the other hand to create a triangular pattern all the way around the pie. Once you have gone around the perimeter of the pie, then go back and lightly press down on the top of the crimped edge to even out the height giving the pie a fancy fluted crust. 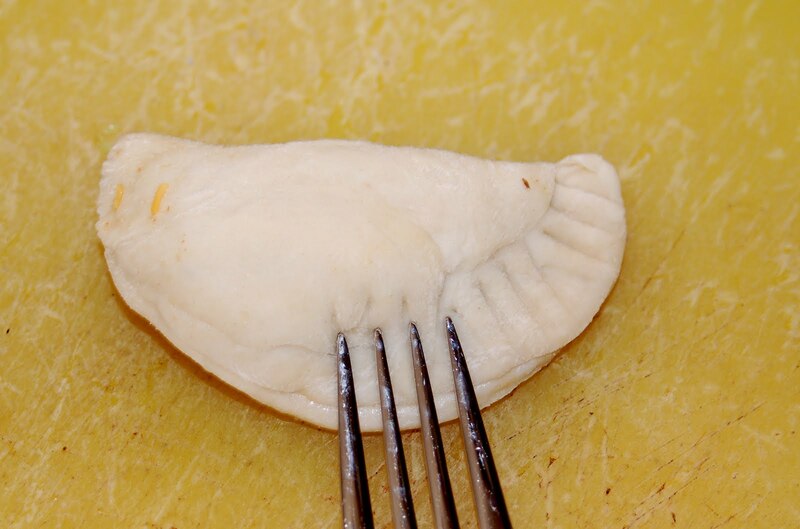 Crimping can also be done with a fork, but is more common on smaller items such as hand pies, empanadas, or pierogi. There has been much debate over the centuries as to how to create the flakiest crust. Some recipes call for ice water, cold butter or even vinegar. My Mom (dubbed the Pie Queen by Dom) uses this super simple recipe with nary a complaint from consumers. This recipe makes enough for two regular pies, a top and a bottom or one large pie with a little leftover. Mix ingredients together until well combined creating a large ball. Split ball in half and flatten out the dough beginning with a rolling pin. This dough is not sensitive to the heat from your hands, so once the dough is fairly flat, you can move it to the pie plate and press it out creating an even layer in and around the plate. Using the technique above, crimp the edge of your crust. The finished crust can be refrigerated until the pie is ready to be added. You can use the scraps of dough to create pretty decorations for your pies using cookie cutters and sprinkling the cut-out shapes with a little sugar before placing them on top of your pie. As a little girl, I loved pie baking day because Mom always had leftover dough scraps that she would roll out and sprinkle with cinnamon sugar. She would bake the little “tarts” until the crust was crispy and the cinnamon sugar melted into a candy topping which was usually still warm as my sister and I came in from the long bus ride home. That's funny, I've never seen a crust recipe that used oil before. I can't recall offhand, but I think I use Crisco. I keep meaning to try vodka, but I don't bakes pies all that often, so I'll probably forget. They say that gives you the moisture you need to form the crust, but it evaporates during baking, so it doesn't make the crust too doughy like other liquids would.